The coaching staff wanted 60 minutes of intense hockey from the Penn State Icers on Sunday afternoon in the championship game of the 15th Annual Manchester Police Athletic League Stovepipe Hockey Tournament. Unfortunately, the Icers gave them 40 minutes, with the second period proving to be their downfall as U-Mass Boston skated to a 7-4 win. The Icers left their game in the locker room in the 2nd period, allowing the Beacons to score 4 straight to take a 6-3 lead after 40 minutes. Tim O'Brien scored his second of the game late in the 2nd, then Marek Polidor scored his 3rd of the weekend early in the 3rd to get the Icers to within 2, but Steven Weston scored midway through the period to make it 7-4. As Beacons coach Peter Belisle told me in the post-game interview, he was worried the Icers would come back. They did, but fell short to a very good team. Senior netminder Ryan Donovan was the big difference, making some big saves as the Icers outshot the Beacons 34-33. At the other end, Ted Hume was replaced by John Jay after giving up 6 goals on 16 Beacons shots. Donovan was named to the all-tournament team, as were Polidor and John Conte. The Icers return home next weekend with conference foe Delaware coming in for a pair of games. A special thanks to the staff at the Ice Den and Chief David Mara, Lt. Ernie Goodno, Sgt. Brian O'Keefe and the members of the Manchester Police Department for their hospitality and for a well-run tournament. Playing less than an hour from home and in front of his extended family, Icers senior center Ryan Paradis put on a show in the Icers' 5-2 victory over NCAA D-II Southern New Hampshire in the opening round of the PAL Stovepipe Tournament in Manchester, NH. The Icers opened the scoring against the host team when Marek Polidor scored his 8th of the season at 14:01 of the second period. But the Penmen responded 46 seconds later, then took the lead at the 16:41 mark of the middle frame. With under a minute to go in the period Paradis, the Rochester, NH native, was sent in alone on a great pass from John Conte. Ryan roofed a backhand to the glove side of Penmen goalie Mike Mastracci to send the teams to the locker rooms tied 2-2 after 2 periods. Penn State owned the third, scoring three unanswered goals to put the game away. Polidor picked up his 2nd of the game and his 2 power play goal at 2:38. Joe Zitarelli went top shelf as well, notching his 2nd of the year to make it 4-2 at 7:13. Fittingly, Paradis finished off the scoring with his 7th of the season and his first power play goal at 11:46. Paradis added two assists to the pair of goals, garnering first star selection. Polidor was the second star, with two goals and an assist, while Paul Daley was the third star with two assists and another solid two-way effort. The Icers outshot the Penmen 42-18. Check out the complete box score here. The Icers will face U-Mass Boston in the championship game at 4:30 on Sunday. The Beacons beat up on D-II Stonehill College 7-2. As Scott Balboni said in the post-game interview, the team can't be tentative like they were in the first period on Saturday. Doing a little web surfing this morning before putting the bird in the oven. OK -- since it's just Barb and I, it's only a turkey breast. Hmm, that means fewer leftovers! Speaking of turkeys, JoeBa sends his T-day greetings from "da 'Burg." In case you did not know, Joe pens a weekly online column. He might have a future as an author. Somehow, I picture Pepto Bismol for dessert instead of pumpkin pie! While checking out the fan forum at US College Hockey Online, I found this quote attributed to recently-retired Brendan Shanahan. 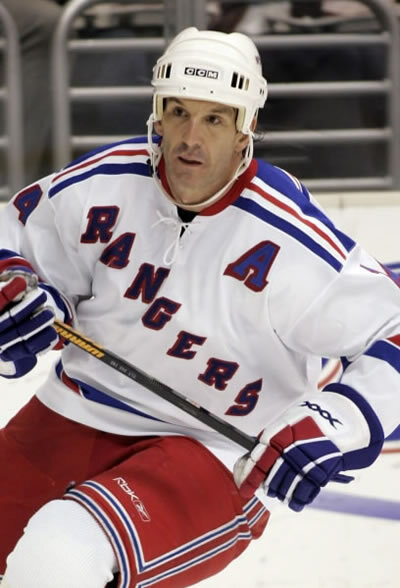 Brendan's a good Toronto boy who had a bit of a career in the NHL, but I just couldn't bring myself to posting a picture of Shanny hoisting the Stanley Cup in a Detroit uniform! Is ice hockey hard? I don't know, you tell me. We need to have the strength and power of a football player, the stamina of a marathon runner, and the concentration of a brain surgeon. But we need to put all this together while moving at high speeds on a cold and slippery surface while 5 other guys use clubs to try and kill us, oh yeah did I mention that this whole time we're standing on blades 1/8 of an inch thick? Is ice hockey hard? I don't know, you tell me. Next question. Next stop -- the Hall of Fame. Eight hours on the road to Manchester tomorrow. I'm looking forward to seeing how the guys stack up against the competition this weekend. Outlook: Club powerhouse Penn State adds a nice twist to this tournament. I’m picking Mass-Boston to beat the Nittany Lions in the finals. The Icers are enjoying some much-deserved time off prior to Thanksgiving, but lets hope they don't overdo it with the turkey dinner. They'll need to be ready to go this weekend as they take part in the PAL Stovepipe Invitational Tournament in Manchester, N.H. The Icers are now 14-1-1 on the season, riding a 10-game winning streak after sweeping two from Navy last weekend. The tournament will be another chance for Penn State to prove they can play with NCAA Div. II and Div. III teams. The Icers open on Saturday at 4:30pm against the host D-II University of Southern New Hampshire. The Penmen are 2-3-2 on the season following a 3-2 loss to the Suffolk Rams on Tuesday. Div. II Stonehill College and NCAA Div. III U-Mass Boston play in the early game at 1:30pm. The consolation game on Sunday will go at 1:30, with the championship game to follow at 4:30. Stonehill is struggling. An 8-6 loss to Nichols College on Tuesday was the Skyhawks' fourth straight, dropping them to 2-5-1. UM-B thumped Framingham 8-3 on Tuesday to improve to 2-1 on the year. While doing my prep work on Sunday, I stumbled upon a familiar name on the UMass-Boston roster. Greg Schwind was a member of the Icers, but only briefly. He arrived in Happy Valley in 2004 and stepped right in to Joe Battista's lineup. On October 22, 2004 Greg notched a hat trick, including 2 goals in 19 seconds, in a 13-1 thumping of Drexel at the Greenberg Ice Pavilion. Two weeks later Greg's season came to an end when he suffered a broken leg in a penalty-filled game at Rhode Island. Road trips to Rhody are usually brutal, but that one was the worst. Personally, it started as we were loading up the bus when Barb called to tell me from Harrisburg to tell me that she'd been hit by a car while crossing an intersection. Fortunately, she wasn't seriously hurt and she told me to get on the bus. Hey, she's a hockey player -- or at least she's married to one. The team lost 4-2 to the Rams on Friday night, then skated to a scoreless tie on Saturday despite outshooting URI 38-17. Schwind wasn't the only Icer to suffer an injury in the Saturday game. Brett Wilson suffered a cut that needed some serious stitch work. After a long wait at a local hospital while the two wounded warriors were treated we finally hit the road in the early hours of Sunday morning. The situation went from bad to worse when the bus driver made a wrong turn somewhere in Connecticut. After what seemed like hours of traveling down two lane roads we rolled past the sign welcoming us to Storrs, which was definitely NOT on the way home. At one point, JoeBa and I - sitting across from each other at the front of the bus - looked at each other as if to say "Where the heck are we?" A little later I was in the aisle of the bus telling the guys that were awake that it seemed like we'd been down every road in New England, at which point Teague Willits-Kelly chirped "Yeah -- every road but the right one!" Needless to say, we got home a little later than expected. Needless to say, I hope the trip this weekend is more successful - and less eventful! Well, that was quite a weekend for the Icers as they swept Navy by a combined score of 17-0 to run the winning streak to 10 games. As I said a number of times on Friday and Saturday, the Midshipmen simply had no answer for the Icers' depth and their team speed. With full respect for the heart of the Middies, when you are outshot by a 4-1 margin it's tough to mount any type of sustained offense. It was a great weekend for the line of Nick Seravalli, Eric Steinour and Paul Daley. Eric potted four goals on Friday and added another on Saturday, Nick scored twice in both games, and Paul set the table for his linemates with some aggressive forechecking. Chris Cerutti and Domenic Morrone each had two goals. Dom leads the team with 11 on the season, and it's interesting to note that 2 freshmen (Morrone and Steinour) are in the top 3 in team scoring (along with Tim O'Brien). I spoke with Nick Seravalli and Chris Cerutti following Saturday's win. Chris Pronchik was the second star, but he was a no-show. He later pleaded innocence, claiming he didn't know he was supposed to come out for a chat. We'll forgive him this time, but I'm not sure his mom, who was listening at home, will be so forgiving! There was a scary moment early in the 2nd period on Saturday. Carey Bell, just back this weekend after recovering from a concussion, was chasing the puck down behind his own net. Carey turned towards the end boards just seconds before Navy's Michael Orzetti made contact. The hit sent Carey hard into the boards and at first glance it looked bad. Fortunately, Bell popped up and was able to continue playing. Orzetti was assessed a 5-minute major and a game misconduct, which was the right call by referee Rick Gallagher. However, as I said at the time, this was another case of a player putting himself in a position to get hurt. I'll reiterate what I said on Saturday - I don't blame Carey for what happened, because that is how players today have been taught to play the game. But, I will reiterate what I said here and here about the need for changes in how the game is taught, beginning at the youngest age. I'll climb down off my soapbox, but not before giving the final word to Ann Hume. Hockey is a physical sport, as you point out, but there have to be limits on the checking and slamming players into the boards that occurs. There is no game that is worth permanent or serious damage to players. At least in hockey players wear helmets and padding and are prepared for a certain amount of roughness. But the fact that seven members of the Icers are out with injuries shows that the game is no walk in the park. I was glad to read in your blog that the Icers players and coaches are aware of the limits and are not so fanatic that safety is ignored. As an octogenarian, I know that there is no wealth that compares to one's health. It is a tragedy to sacrifice that treasure to sports in one's youth, or to sacrifice peace of mind to the life-long guilt that follows injuring an opponent in a game. It's time to get ready for the long drive to Manchester, NH for next weekend's PAL Stovepipe Tournament. The Icers will be facing the host school, NCAA Div. II University of Southern New Hampshire on Saturday at 4:30pm. Barb and I would like to wish you all a Happy Thanksgiving. For those of you heading to New Hampshire, safe travels and we'll see you there. Just a quick Saturday morning update after the Icers' 9-0 romp over Navy. The Icers (13-1-0, 8-0-1 ESCHL) outshot the Midshipmen (6-12-1, 0-8-1 ESCHL) 53 to 12, including an incredible 31 to 2 differential in the 2nd period. Navy simply had no answer for the Icers team speed, but you know that the Middies will be gunning for a win this afternoon. Eric Steinour had a career night, with 4 goals and 2 assists. Eric is now 3rd in team scoring behind Tim O'Brien and Domenic Morrone, who also scored last night (his 10th). Nick Seravalli chipped in with a pair of goals. After the game I spoke with Nick and Eric. Third star Chris Cerutti was being tended to by the trainers and made it out from the locker room as I was signing off. Sorry, Chris! On a personal note, thanks to everyone who came out to Damon's following the game to help celebrate Barb's birthday. My "executive producer" hit the big 5-0 on Wednesday, but having our Icers family on hand helped eased her pain! The role of a captain on a sports team can be defined by one word -- leadership. Some captains approach their role in an outgoing style -- using their strong personality to lead from the front. Others are less vocal -- preferring to lead by example and picking their spots to make their view know. Icers co-captain John Conte falls into the latter category, despite his well known Jersey personality. On Saturday, with the Icers trailing Rhode Island 3-1 after 40 minutes, John had seen enough. The coaches dressed down some of the players, and John let his teammates know how he felt. Whatever was said worked, resulting in a solid 3rd period that saw the Icers erase the 2-goal deficit before the eventual 4-3 shoot out victory over the Rams, completing the weekend sweep. What made it even sweeter for Number 6 was that coach Scott Balboni chose him as a shooter. John didn't let the coach or his mates down. Thanks to Michael Ivanir, father of Dan "Muffin" Ivanir, for another great photo montage from Saturday's 4-3 shootout win at Rhode Island. You can see all of Michael's photos from Saturday here. Pay no attention to that man behind the laptop! Here's the video, with the calls from your humble correspondent. A quick update from my hotel room in Rhode Island before shutting it down for the night. After laying a rather large egg through the first 40 minutes of Saturday's game against Rhody, the Icers found their game in the third period, storming back from a 3-1 deficit to tie the game and force overtime. Steve Thurston and Paul Daley were the heroes in regulation, after Marek Polidor scored for the Icers in the 1st period. When neither team could score in OT the Icers were on their way to their second shootout of the season. George Saad opened up with a goal, followed by URI's Jay Dupras. Ted Hume got a piece of Dupras' shot and sent it off the crossbar. Scott Balboni surprised a lot of people (including me) by going with John Conte, who beat Joe Spagnoli low after Saad had gone top shelf. That put the pressure squarely on the Rams' Kyle Krannich. When his backhand slid wide of Hume and the goal the Icers poured off the bench in celebration of a hard earned gut check win. Afterwards, the coach shared his thoughts on the victory. Thanks to Paul Daley Sr. for manning the camera. Simply put, it was the Icers' best game of the season as they put together a solid 60 minutes in Friday's 4-1 win over Rhode Island. The victory improved Penn State's record to 11-1-1 and 6-0-1 in ESCHL play. The loss was Rhode Island's first at home and first in conference play. They're now 11-4-0 on the season and 6-1-0 in conference action. Once again the freshmen stepped up and did a great job, especially considering that Marek Polidor and Chris Pronchik were serving their suspensions. Nick Seravalli (6th of the year) and Jaryd Coleman exchanged first period goals. In the second, Chris Cerutti tapped in a loose puck that got past URI goalie Joe Spagnoli for his 6th of the season. I called Steve Thurston on the insurance marker in the 3rd, even though the goal was credited to Mike Broccolo. Turns out I was wrong and the officials were right. Broccolo told me after the game he tipped Steve's shot past Spagnoli, giving him his 4th of the season. Ryan Paradis iced the game with an empty netter, his 4th of the year. The star of the game; however, was Ted Hume. Big Teddy rebounded from a subpar performance against Navy a week ago and was simply outstanding. As Scott Balboni said in the post-game interview, Ted made some huge saves when he had to, especially in the 2nd period. The Icers did a great job of bottling up the Rams in the 3rd period. The forechecking by all four lines frustrated the Rams, who had difficulty getting out of their defensive zone. Now, we have to see if the Icers can carry the momentum into Saturday's rematch. Last season, a win on Friday at the Boss was followed by a lackluster Saturday loss. Hopefully history doesn't repeat itself. Just a quick hit this morning as the Icers hold a game-day practice at Choate Rosemary Hall in Wallingford, CT before heading to North Kingstown for tonight's first of two with Rhode Island. Not only are Scott Balboni and Bill Downey having to deal with all the injuries, they will be missing Marek Polidor and Chris Pronchik tonight. Both will be serving their one-game suspensions assessed following last Saturday's dust up at the end of the game at Navy. Certainly not what the coaches need as the #6 Icers face a very good #7 Rams squad in front of what will be a hostile home crowd at the Boss Arena. This arena at Choate is fabulous, with one caveat. The home team locker room facilities at this New England prep school put many major college facilities to shame. The ice is hard and fast, and it's no wonder. It's darn cold inside this arena. Last year when the team practiced here it was like a meat locker. I remarked that I was never that cold playing outdoors back home in Canada! At least this year, they threw a couple of extra logs on the fire, making it bearable inside for those of us not skating. After practice we're off the Steve Thurston's house for a team meal. It will be a bittersweet visit, not seeing big Bill Thurston's smiling face and enjoying his welcoming handshake. But we know he's there in spirit, and every day we're thinking of Bill, Valerie, Chris and Steve. Here's a quick look at the rink as the guys were warming up. The banners honor the US Olympians who have attended Choate Rosemary Hall. Quite an impressive list. It's Thursday evening, I'm sitting in the Holiday Inn in North Haven, CT while the team buses its way to New England for this weekend's series with Rhode Island. I drove up to look after some personal business, and so that I won't have to ride home on the bus after Saturday's game! I'm looking forward to Sunday, because on the trip home I'm going to visit with John Dufford, one of the original Penn State hockey players. Killing time in Connecticut gives me the chance to update you on Ben Fanelli. If you recall, earlier this month, I blogged about the 16-year old defenseman for the Kitchener Rangers on the Ontario Hockey League. Fanelli was seriously injured when he was slammed into the boards by Erie Otters forward Michael Liambis, who has since been suspended for the season by OHL Commissioner Dave Branch. On Wednesday, Toronto Sun columnist Joe Warmington reported that Ben is out of the hospital and recovering from his injuries at his suburban Toronto home. As I wrote, the hit was another example of the lack of respect shown by players at all levels. It is also an example of how players today are taught a different way to play along the boards than how we were taught when I was younger. Well, none other than Don Cherry and former NHL goalie Kelly Hrudey have joined the chorus. "Grapes" has been preaching for changes in coaching and equipment for years, as you will see in last Saturday's "Coach's Corner" segment on Hockey Night in Canada. By the way, the second half of the segment is Don's homage to Canadian soldiers who paid the ultimate sacrifice in Afghanistan. Hrudey, now a HNIC analyst, used an unscientific process to determine that players turn their faces to the boards as many as 600 times in a 60-minute game! "Here’s how I came to that number. I simply replayed a game from this past week and watched around 10 minutes of action. I counted how many times in my opinion players put themselves at risk, and then multiplied that by six. True, not the most scientific procedure, but I’m pretty sure the numbers would bear out over a full 60 minutes in most games. Again, it means 600 times that players are putting themselves in the most vulnerable position possible." "(W)hy don’t we consider giving minor penalties to all players that intentionally turn their back to “protect the puck” when they are within five feet of the boards? It seems to me open ice hits are not nearly as dangerous and catastrophic as when the boards are involved." Certainly something to think about! There's no resting on their laurels for the Icers after last weekend's sweep of Navy at Annapolis. With the Rhode Island Rams awaiting this weekend as the Icers embark on the longest road trip of the season, they'll face a team that has jumped to #7 in the latest ACHA rankings - just one spot behind Penn State. Between the growing list of injuries and the likelihood of one game suspensions to Marek Polidor and Chris Pronchik following the donnybrook at the end of Saturday's 5-1 over the Middies, the freshmen are going to be heavily relied upon by Scott Balboni and Bill Downey. I also caught up with Tim O'Brien before Tuesday's practice. Tim says Saturday's win over Navy was a big confidence builder for the freshmen, especially the defense. I don't know if Navy goalie Eric Anderson was channeling Admiral Farragut in the bizarre final seconds of Saturday night's 5-1 Icers victory, but it sure looked that way from my spot at the other end of the ice. Mr. Anderson had faced a barrage of 60 shots, and with Marek Polidor bearing down on him on a breakaway, Anderson gave up any pretense of being a goalie, went to flank speed, and rammed headlong into the onrushing Icers forward. The ensuing donnybrook involved everyone on the ice except Anderson, who had executed a perfect hit-and-run attack, as well as Penn State freshman goalie Dan Ivanir (more on him in a moment). Fortunately, cooler heads quickly prevailed. The teams shook hands and lined up for the Navy alma mater, but the controversy continued as the officiating crew retreated to their locker room and sorted out the punishment. Polidor and Chris Pronchik were slapped with game disqualifications, which didn't sit well with Scott Balboni. It remains to be seen if the pair will be eligible for Friday's game at Rhode Island. Now to the positives on the night. Pronchik scored the team's first shorthanded goal of the year in the 1st period and added an even strength goal in the 2nd (the eventual game winner). Polidor, Nick Seravalli and George Saad chipped in with 3rd period goals that gave the Icers a 5-0 lead. With Dan Petrick out with a sprained shoulder (and joining me to add his excellent analysis on the webcast), the Icers were down to 5 defensemen - 4 of them freshmen! Steve Thurston and Rich O'Brien logged a ton o' ice time, while Mac Winchester, Dan Loucks and Brian Dolan helped to build a seawall in front of Dan Ivanir, keeping the Middies at bay through most of the night. Ivanir, nicknamed "Muffin" by his mates, came up 3:05 short of recording a shutout in his first game as an Icer when Mitch Pulver slid a loose puck past Dan to ruin the bid. Dan's parents were on hand to watch him play. Michael Ivanir had camera in hand and captured some great shots of his son. Today, he sent me a video montage set to music. I've taken the liberty of adding some comments and my post-game interview with Dan. Here's a link to Mr. Ivanir's gallery of photos from a number of Icers' games. Great work, Michael, and thanks for the outstanding video! It was ugly, but the Icers found a way to win on Friday night, topping a pesky Navy team 6-4 at the McMullen Arena at the Brigade Sports Complex in Annapolis. It was a game that should not have been in doubt, with the Icers outshooting the Midshipmen 48-22. As expected, Navy played a solid 60 minutes, while the Icers left the best aspects of their game on the bus. The injury list continues to grow. John Conte did not make the trip, adding another veteran to the walking wounded. That meant a lot of freshmen getting a chance to show what they bring to the team. Tim O'Brien told me at the end of the first period that there were no excuses for the poor effort, which continued through a full 60 minutes. Head coach Scott Balboni said in his post-game interview that he was not impressed. Penn State led 2-1 after 1, then the teams traded goals in the 2nd period, with Dan Loucks' power play goal at 16:30 giving the Icers a 5-3 lead after 40 minutes. Navy got back to within a goal when Tom Fick scored at 3:56 of the third. Paul Daley put the game away with a rare empty-net power play goal with 44 seconds left in regulation. Steve Thurston scored twice, garnering first star recognition, while Daley's goal and 2 assists got him 2nd star honors. Navy goalie Jameson Marshall stopped 42 Penn State shots and was named 3rd star. The Icers will need to come up with a better effort throughout the lineup for Saturday's rematch. Game time from Annapolis is 7:30. If you've heard me interview Scott Balboni, you know that the coaches have been looking for a complete 120 minutes of hockey on any given weekend. The Icers came close last weekend, with two convincing wins over West Virginia. They'll need 120 minutes of solid hockey this weekend when they resume ESCHL conference play against Navy. It is a given that service academy teams may not get the best athletes in any sport, but it is also a given that those service academy teams will battle you until the bitter end. That is certainly the case with the Midshipmen hockey team. It doesn't matter what the score, the Middies keep coming until the final buzzer. We've seen that year in and year out, and I have the utmost respect for Coach Fox and the job he does with his men. The dedication of the Navy teams the Icers have faced over the past few years speaks volumes to the quality of the men that some day could put themselves in harm's way to defend this country. We salute them for their service, as we do all the men and women who serve this country and other freedom-loving nations. It's going to be fun for me being back at the Brigade Sports Complex. I'll be calling the games from ice level, which offers some challenges, but sure gets me up close and personal to the action. The coaches ramped up the intensity at today's practice. I caught up with Assistant Coach Bill Downey after practice. Is the word unknown to today's hockey players, from the NHL to the youngest youth leagues? I don't know, but look at this video and ask yourself the question. 16-year old Ben Fanelli of the Ontario Hockey League's Kitchener Rangers remains in serious condition after being plastered into the end boards on a hit by the Erie Otters' Michael Liambis. Was it a head shot? Not from the view in the video. Did Liambis leave his feet? No. Was it a vicious, illegal hit? Not by the rule of law in the rulebook. Back in my day, and not all that long ago, that was called "finishing your check." Unfortunately, all too often today finishing a check involves drilling an opponent who has his head down. Doesn't matter if it's against the boards or in open ice, there have been too many incidents (head hunting or not) that have left careers and lives in tatters. Ben Fanelli's future as a hockey player is in doubt, and the hit has also left Michael Liambis a shattered young man. As Steve Simmons wrote in today's Toronto Sun, "(s)ince the incident, Liambis has hardly stopped crying and he's not alone." That is the fine line, the indiscernible line between legal and illegal, proper and improper. Where does it start and where is it crossed ? 1) RESPECT - Do young players, whether they're in Major Junior or peewee, see their heroes in the NHL smoke someone and say, "Hey, I need to do that" or is it just a case of not thinking about what could happen when I drill a defenseless opponent? Most youth organizations have added STOP signs to the backs of sweaters, which is helping cut down on the hits from behind, but we see it all the time in the ACHA and other levels of hockey. Even with the speed of today's game, players should take a second and think before lowering the boom. 2) COACHING - Do today's coaches, especially at the youth level, teach their players to keep their head on a swivel? I'm sure they do, but I don't believe that they stress it as much as coaches did back in my day. I've said this a number of times -- we were taught to not turn your back on an opponent when you're close to the boards. Back in the day, we were taught to turn a shoulder into the boards (and keep your head on a swivel). Going back to teaching and playing that way would lessen the number of dangerous hits from behind. 3) EQUIPMENT - There is no doubt that today's equipment contributes to the soaring number of head injuries in the game. Don Cherry has been arguing the point for years on Hockey Night in Canada, and he's absolutely right. The shoulder pads worn by today's players are not much different than those worn by NFL players, and the elbow pads might as well be made from steel. There's so much hard plastic worn by today's players that even the strongest helmet strapped tightly on a kid's head can offer enough protection. As you can see, Ben Fanelli's helmet came off during the hit, leading one to wonder if his chin strap wasn't as tight as it could/should have been. Here's Grapes venting on a Coach's Corner segment from the 2007 Stanley Cup Finals -- you'll find it about half-way through the video. The Icers delivered a treat for their fans on All Hallows Eve, skating to a convincing 8-2 win over West Virginia on Saturday afternoon. With the weekend sweep of the Mountaineers, the Icers record improves to 8-1-1 with a pair of conference road trips coming up. Once again, the scoring was spread throughout the roster, with 7 different scorers. Eric Steinour led the way with 2 goals, while Dan Loucks notched his first as an Icer. Chris Cerutti, Marek Polidor, Tim O'Brien, Chris Pronchik and Kurt Collins all added singles. Unfortunately, the injury list grew by two, with Collins and Nick Seravalli both leaving with undisclosed injuries. Speaking of leaving early, Steve Thurston must have wanted an early shower, picking up a questionable minor at 6:51 of the 3rd, before getting slapped with a 10 minute misconduct by referee Scott Palmento. The 12 minutes sent Steve over the 150 minute mark for his career, a day after John Conte reached the dubious milestone. Hold on a sec....12 minutes in penalties? "Sweet Lou" should have served his time in the box! Guess that's why he was chuckling with the linesman as he left the ice! Now, through the magic of digital editing, here's my interviews with the 3 stars. Not bad for a first effort by Barb with the camera and the camera shy guys in various stages of dress undress!